14th July - 5th August. I was introduced to Yau Bee Ling’s work in 2005, when we shared a year on residency together in Malaysia. It was a year of transition for all and her paintings jarred with the tensions of a new home, of family responsibilities with a new marriage, her identity as a Chinese woman, and finding her voice following success early in her career. We witness the work’s transition from nostalgic portraits of a home shared with 12 others and its suffocating intensity, scenes often focused on the ritual of dining, to still life and a more feminine space of bedroom dresses, abandon tables and abstracted angles that seems to regurgitate the lessons of art school. The figure was expelled from these works, yet there was always looming presence just beyond the frame. They carried that tension of overbearing or a lack of resolve. This exhibition Portraits of Paradox, made two years later floored me. Yau had found that maturity for which she had been searching. 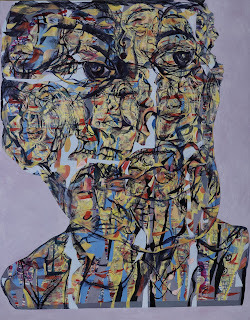 This is an exhibition of deeply psychological portraits that are bold and confident and probing. Gone is the cute naïveté of the earlier works and in its place a brave engagement with the sitter and the self. Take Pride (2008) for example, with its face slightly upturned indignant, and sitting on a flat, red field. The internal pattern of the face is at once controlled in its rhythm zigzags and yet the over painting is brushy, gestural. It captures the many personas or emotions that make up our everyday. What is most affronting when standing in front of these paintings is their scale. These aren’t ‘pretty’ paintings and they draw you into their turgid space. 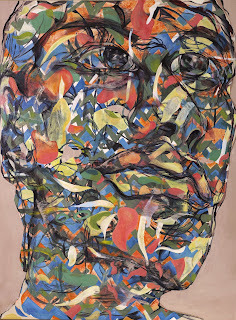 The most obvious read is their frenetic oscillation between pattern and portraiture. It is almost a metaphorical fracture, a disconnection with the subject that she couldn’t achieve in her early work and one that has allowed the critical distance in constructing the image. This is most easily read in the way these images are layered, abstracted mark, eventually defined with the clarity of a black line, and masked off with solid color. The device of framing the face has a curious control that is imposed over the internal vibration within these images. In the two works, both entitled Constantly Repressed (2008), Yau magnified this vibration to a scream. These works are scarred with almost frenetic, linear brushmarks that seemingly strike out the face. She attempts to regain that control with exaggerated facial definitions in black and cool blue background. Yau’s paintings have always been characteristically awkward in the way forms interact. 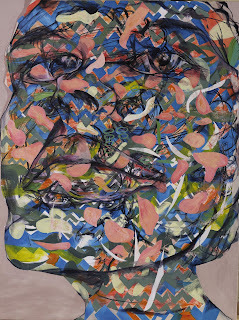 What is interesting in these new works is that she doesn’t shy from that uncomfortable space and cover it with what curator/artist Anurendra Jegadeva called, “ fiesta color” While these are not totally resolved paintings, they should be celebrated for their strength and affirmative direction. The painting that arrives at that new place with a casual knowing is The Meeting (2008). Hanging on the end wall in the gallery-huge diptych-it commanded the space. It sits at that point where figuration truly tips into abstraction and the unconscious dances with knowing, acceptance and delight in the other. 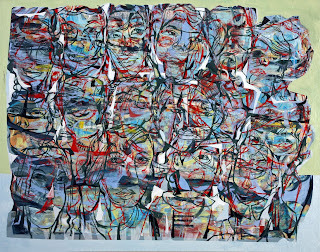 This painting projects a bright future for Yau’s work.